“I’m here as a friend and a fan,” Grand Ole Opry star Jan Howard declared to a crowd of Jesse McReynolds’ closest friends and family on July 13th, 2014, in Gallatin, Tennessee. 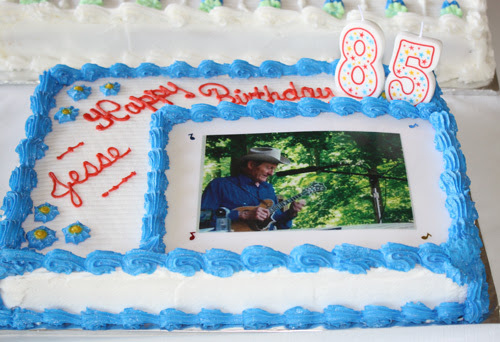 It was a lively gathering on a sunny Sunday at Jesse’s farm, the Pick Inn, to celebrate his 85th birthday and there was no shortage of tributes from Jesse’s colleagues, neighbors and friends. Nine of Nashville’s finest, Homer Bradley (the unofficial “Mayor of Cairo”), WSM announcer Eddie Stubbs, fiddle-player Jim Buchanan, Opry stars Jeannie Seely and Jan Howard, Carl Jackson, banjo-player Mike Scott, Larry Stephenson and Sam Bush, roasted McReynolds who was praised for his sense of humor, his mentorship of other artists, his contributions to bluegrass music and, most of all, his sincere and kind personality. “He was just what I wanted him to be,” said Stubbs of his first meeting with Jesse, “we learned so much just by observing these people…they set the bar really high.” Jeannie Seely echoed that sentiment telling the party, “he always kicks things up just a little notch.” Orchestrated by Master of Ceremonies, radio host Harv Mason, the nine roasters proclaimed their difficulty in finding anything negative, however silly, to joke about with Jesse. “There’s simply nothing bad you can say about that man right there,” Jackson insisted, a fact that was seconded by the others. They told stories of the road, of riding on the tour bus throughout the years, of how the brother-duo Jim & Jesse had influenced their careers and of Jesse’s unique style. “He’s his own person,” remarked Sam Bush and Larry Stephenson called him, “a class act.” A fitting tribute to a man who’s spent over six decades entertaining the world with his cross-picking mandolin playing and quality bluegrass music.It wouldn’t be a birthday party without a little music so Jesse took to the stage joined by members of the Virginia Boys band, his grandson Garrett McReynolds and his friends the Crowe Brothers, Del McCoury and Sam Bush. Together, they treated the crowd to bluegrass and country favorites providing a perfect ending to the celebration. “They would come out dressed like a million dollars and put on a great show,” Stephenson said of watching Jim and Jesse perform throughout the years. At the celebration of his 85th birthday, Jesse McReynolds proved, once again, that the show does, indeed, continue on. “He’s not content to rest on his laurels,” Eddie Stubbs observed. Jesse agreed, “I may be 85 but I still have a lot of things I want to do.” JESSE McREYNOLDS became a member of the Grand Ole Opry in 1964. Alongside his brother Jim, he’s recorded more than fifty albums featuring his innovative cross-picking and split-string style of mandolin playing. Jesse is a recipient of the National Endowment for the Arts’ National Heritage Music Fellowship Award and a member of the International Bluegrass Music Association’s “Hall of Honor”. He was nominated for a Grammy as part of the celebrated duo Jim and Jesse in 1992 for the album “Music Among Friends” and Jesse received four additional nominations for his work with other artists. Following Jim’s death in 2002, Jesse carried on the McReynolds tradition touring with his band, the Virginia Boys, playing festivals and concerts across the country as well as making regular appearances on the Grand Ole Opry. His current release, Jim & Jesse McReynolds & the Virginia Boys – Radio Shows, a collection of 24 fan favorites recorded in 1962, is available via Rural Rhythm Records. More information on Jesse’s long career can be found at www.jimandjesse.com.